DoceLunes is tucked in its own little corner of the jungle. It’s just like a paradise in the jungle! It is a place of peace, happiness and health. The rooms are very spacious and bathroom are also clean and extra large. The staff is very friendly and attentive to all your needs. The pool area and grounds are lovely and are immaculately kept up. DoceLunas is situated back at the base of the jungle which provides a great early morning breakfast experience. 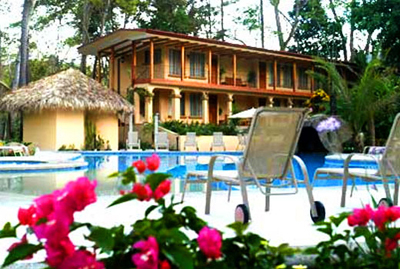 While other hotels in Jaco Beach are mostly located on the main street through town which is more developed and has fewer trees, hotel DoceLunas provides luxury lodging at the base of a jungle covered mountain. 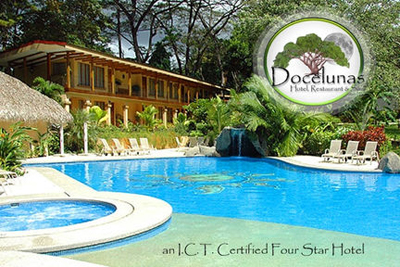 Come find your tropical paradise at Hotel DoceLunas, an affordable Four Star hotel in Jaco with twenty rooms and five acres of jungle gardens full of birds and wildlife. Surrounded by rainforest covered mountains, and rolling hills, you won’t believe how tranquil it is. Docelunas is an eco-friendly hotel and we believe in the importance of sustaining this beautiful environment. Over 400 species of bird call this area home and 150 of those have been seen on the property itself. Docelunas offers a very personal and private boutique hotel experience, with only twenty rooms amid beautiful tropical jungle gardens. DoceLunas arranges complete yoga retreat vacation packages so you can leave the details to them and save your time and liveliness for yoga practice and to visit the parks and beaches around Jaco. 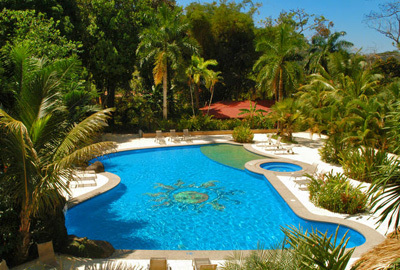 Their excellent Jaco Costa Rica hotel, with five acres of landscaped grounds and towering trees blending into the jungle covered mountain behind the yoga studio is the ideal place for a quiet and relaxing Costa Rica yoga retreat surrounded by natural beauty and luxurious tropical vegetation. Their light and airy yoga studio with floor to ceiling mirrors down one wall and French doors opening onto a terrace above their beautiful gardens provides an ideal venue for your Costa Rica yoga retreat.